When we started tawaf, I was like yo, let’s just go to the ground floor, but my parents weren’t feelin it. We split up and they eventually went back up and made tawaf in the gallery of the first floor, while I went in closer. It took me 3 rounds to get closer. Alhamdulillah, as painful and packed as it was, I managed to make it to the Ka’aba, with Allah’s Help of course. I touched the walls on different sides on my 3rd, 4th and 5th rounds. On my 4th round, I even got to hang on the door of the Ka’aba (al-Multazam) and make du’a, Alhamdulillah. I also got to go to the little half-circle (Hijr of Isma’il) and pray 2 rak’ahs! It was the first time I had done that, Alhamdulillah. That section used to be part of the original dimensions of the Ka’aba, so praying there is like praying inside the Ka’aba, according to the Prophet. It was a great little break from making tawaf, I was dying. I felt like I was gonna pass out, it was so physically draining and tiring today, more than any of my other tawafs have ever been. On the ground floor, amidst the crowd, the temperature felt like it was no less than 110 degrees. Thousands of bodies are packed together so tight, and you literally have no control over where you go. If the mass sways, you sway, if the mass turns, you turn. There is no separation, only the congealed mob of bodies of Believers, crying out to the Lord of the Ka’aba. It’s an incredible experience. Phenomenal. So many people, from all over the world, Chinese, Indonesian, Pakistani, Russian, Afghan, Egyptian, Iranian, Malian, Bengali, and more and more…all crying out passionately, weeping as they circumambulate The Sacred House out of complete devotion to The One. It’s so profound to see how touched everyone is, the universality of this experience is amazing. It’s also pretty dangerous, honestly, that many people fervently crammed together, all trying to move through the same space. Many times, I almost fell or would get caught with my body turned so awkwardly, unable to even stand straight from the lack of space. I would be twisted unnaturally and then have to continue to keep walking this way for many yards, while trying to keep my balance so I wouldn’t fall and get trampled. There’s no way to fight it, the drop of water cannot move the ocean. You have no choice but to let yourself go, to submit yourself to it, to the Will of Allah. He it is, who controls the waves. He creates openings you can jump through, don’t hesitate, just go. Jump through every open door, rush at every opportunity. That is how we’re meant to interact with Allah’s Bounties. Take advantage of them and He will show you why. Open yourself up to the openings and receive Him directly into your heart. I got to take some pictures and video at the walls of the Ka’aba. That was dope. I figured, this was a chance not many people have – to be at the foot of the Ka’aba during Hajj, surrounded by record-setting millions. I had to get some footage. My memory card was full though. Also, took some time to find my camera in my bag, but i wasn’t going to give up. That was one thing I’m sorry for. I was on the wall of the Ka’ba, rummaging through my bag and then scanning through my camera to delete pictures and make space. But, I got some shots up close and some video of me getting to touch the Ka’aba. So dope, subhanAllah. I’m really thankful for it, it’s epic. Definitely gonna run those online when I get back iA. Ok, so, it was such a beautiful experience, but it was surrounded by difficulty, like gift-wrapping a Quattro’s cheeseburger in some barbed wire. For example, there’s trash all over the ground around the Ka’aba. You have to be so careful when you walk to not step on anything sharp, but…you can’t even see the ground! Everyone is that packed together. So, every step you take, for the duration of the 7 rounds, has to be delicate and careful. I was pretty much tip-toeing the whole time. I would get so much stuff on my feet, and I’d constantly be reaching down and trying to wipe them off as I was moving along. I came across so many safety pins, you don’t even understand. I would see them and dart down and pick them up real quick, so no one else would accidentally step on them and puncture their feet. The worst part though, is how panicked people get. As they would be moving along, when it would get too intense, some people would really freak out. Don’t panic in the ocean, that’s how you get drownded. Trust me, I know from experience. I almost drownded before, good thing Amer saved me :). You have to completely let yourself go, no fighting or freaking out. People cling so tightly to each other, looking for support with those they know, forgetting they are with Allah, the best of Caretakers. That’s when it gets ugly. That’s when they start getting divisive and start pushing, and others fight back, self-serving through self-action. The wave guides and provides, the droplet can do nothing for itself, save what the wave allows and facilitates. Be patient, you will be get yours when the time is right. Stick with the struggle until then, that is your role. 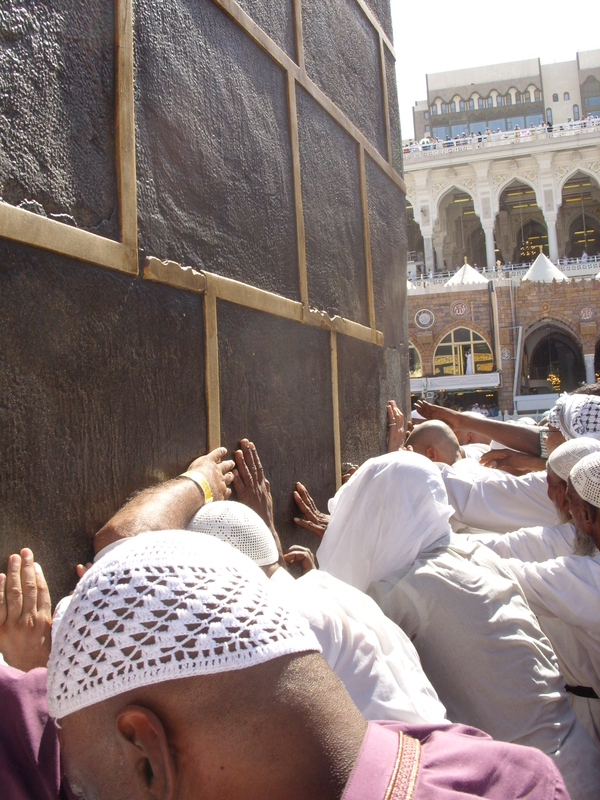 This video shows the scene surrounding The Black Stone, where many pilgrims push and shove to get close enough to kiss the stone, as the Prophet would do. There is a guard overseeing the corner where the stone is mounted, he’s the one that put his umbrella out in front of me when he saw me approach with my camera. You can’t actually see the stone, it’s entirely covered by the mob surrounding it. If you notice the man on the left, at the end of the video, wearing blue and leaning down, his face is where the stone sits. It’s the most intense and difficult spot to be in, throughout the entire Haram, nearly impossible to reach without putting up a serious fight. The closest I ever got, was touching the stone with my fingertips, by reaching desperately over the heads of dozens of other pilgrims. The best technique for moving in and out is to tag along. People are going to link up and fight their way through, you dont even have to do anything physical, just follow. Space will usually stay open long enough for you to pass through if you stay close. As the train of pilgrims passes by you, just jump to the back of the line, and go along as far as you want. Keep looking for openings, keep moving. I imagine that’s how the Sirat Al-Mustaqim is, visually. At each step, the next best step is not always the one directly ahead of the last. Quite often, you’re better suited for reaching your destination by stepping side-to-side, slowing down, speeding up, taking a step back – it’s forever-shifting, never constant. With every step, you have to re-evaluate and strategize the next move, with the ultimate destination clearly in mind. You’re never set for life, along one track. Everyone must always face moments where they have to make decisions to change things up, this world is entirely temporal, and so must be our plans and paths. Sounds like Sirat Al-Mustaqim to me. It’s so difficult to catch and even more difficult to stay on. You’re bound to fall off and slip, that’s why new openings are always emerging, if you miss one chance, stay alert, stay hungry, don’t settle. Don’t give up on trying to move forward out of frustration or loss of confidence. If you stop, let it be to sufficiently rest, then get up and move on. You’re not defeated or lost until you stop moving and looking for opportunities to grow. Eventually, you learn to recognize when you’re on the path, and you develop the knack for staying on. The quest for balance and the middle way :). No wonder it takes time, you have to fall off so many times before you learn how to keep your feet firm. You must look within and know which of your actions knocked you off track, and stop them before they occur again in the future. Finding that middle ground takes time and patience, but once you’re there, you have experience and expertise to keep yourself, and others, firm, on the right. I realize I talk alot about tawaf, and talking about tawaf leads me to talking about so many other things. It’s literally one of the most inspiring and thought provoking rituals I’ve ever done, Alhamdulillah. It took me 2 hours to do tawaf. I did 6 rounds inside, on the ground floor, and I was beyond exhausted. I started to make my way to the outer circles and completed my 7th round in the covered gallery of the 1st floor. That one round alone took me half an hour. It’s tight and uncomfortable, but it goes by much faster on the inside. Afterwards, I wanted to do Sai’y upstairs, where there were less people. After getting so crushed and pushed around, I didn’t want to be near anymore people. It was so bad that as I was walking from one place to another, people would continuously bump into me or push through, against traffic, and I’d cower and curl up. I had to. Otherwise, I may have gotten crazy frustrated and snapped. I had to push all that way, way down deep inside and just take it.